Florida Governor Rick Scott WENT OFF on Obama on Friday after the president came to the Sunshine State to politicize the Orlando massacre. Bill Hemmer: Yesterday, the president came and said the fight against ISIS has been relentless. Do you believe that? Governor Rick Scott: It’s still here. Now think about that, we had 49 people slaughtered. I have still have people, my citizens, in hospitals. We have got, now listen, I’m fed up with this… When do we stop and say, ‘Enough’s enough!’ When are we going to absolutely say our number one focus, destroy ISIS! Stop radical Islam! I mean I do not want this to happen in my state again. This is disgusting. I’m fed up with it. It was an attack on our gay community, our Hispanic community… This has to stop. Bill Hemmer: The message yesterday was about guns in America. Do you agree with that? 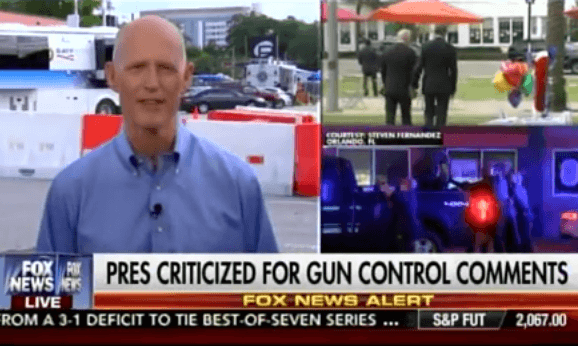 Governor Scott: The Second Amendment didn’t kill any of these individuals. Evil killed them. ISIS killed them. Radical Islam killed them. We’ve had the Second Amendment for over 200 years. We are not doing enough to destroy ISIS. We need a president right now to say, besides building the economy, our number one focus right now is to destroy ISIS! People care about their safety. They’re scared to death. I’ve talked to so many people who are worried about are they going to be a target. That’s not how this country should live. We have the resources. Destroy ISIS.